Homemade solar cooker/oven and my results? some kids that put it all together. Hi, I am a middle school math teacher in sunny Encinitas, California where I am currently teaching summer school to a group of middle school students. 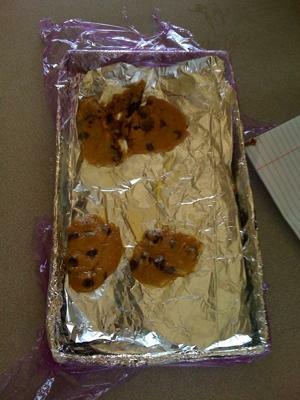 The idea of making a homemade solar oven came about when one of my students shared a story about how a couple years ago during Astro Camp they used solar ovens to bake cookies. I thought this was a neat way to introduce real mathematics and engineering in the classroom and to promote the various sciences and sustainability energy. Topics such as heat, time and energy transfer (which is the basis of thermodynamics) was introduced in numerous occasions. The students brought in things they had in their homes like aluminum foil, duct tape, boxes, and plastic wrap to name a few. It was slow going in the beginning but as soon as they saw the oven coming along some students even came to school early to work on it before class. In a matter of days we had a very crude working solar oven. We had a good time inventing and experimenting, as well as trying new designs. I observed my students working diligently with the end goal of eating those gooey cookies and at the end; it was very gooey. As I saw my students eating the cookies, I thought why not promote the idea of sustainability and the power of the sun during the school year with a real demonstration of something they can see. Living in San Diego there is certainly no shortage of the sun throughout the year, and with the big push to promote solar energy in California; I thought: I can do my part in introducing the power of the sun in the classroom. With a properly working solar oven I can promote renewable energy and the power of the sun on an ongoing basis in the classroom. Thank you for reading my story. 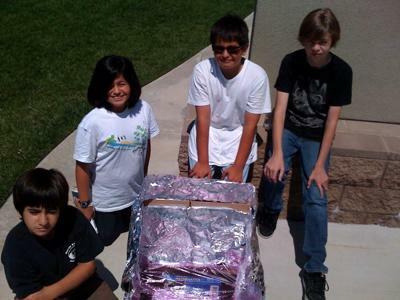 Thank you very much for your story about your solar cooking "enlightenment" and how you were able to use it as a tool for teaching principals of science as well as a means of directing/focusing the interest of your students into the fascinating and "satisfying" world/art of solar cooking.